Bustin' Diabetes for Justin: Busy Busy!! So the last few weeks have been super busy! We got to enjoy the water park, and no rain, yay! LOL Justin was super happy to have his buddy join us for the day. I had a waterproof container that I wore around my neck all day, with a spare meter a few strips and some candy in case of any lows. We did great all day, until about 30 minutes before we left. We were on the lazy river & Justin said he felt low. Luckily we were right next to an exit with stairs, so we sat on the stairs and checked.....he was low :( So he had a few candies, and we waited 15 minutes to recheck, then I realized I didn't have any more strips with me, so I carried him back to the exit closer to the locker where the other meter was, because he was saying he still didn't feel well. I was scared he was crashing after swimming all day. But I rechecked and it was fine, just over 100. So he was just hungry for dinner.....& Tired! So we go back again in 4 months.......just keep doing our best everyday. Even though its not easy. We had a great time on vacation last week. 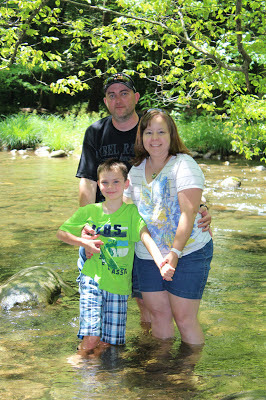 We visited Gatlinburg, TN in the middle of the beautiful Smoky Mountains. Justins BG was pretty good on the car ride there and back, the Dr. had warned us he may run high & that its ok....shes so reassuring. That book has become my diabetes bible, between it and her wedsite I feel like there isnt anything I cant figure out. I totally feel the same about that book! I had bought it on my nook, then had to get a hard copy!